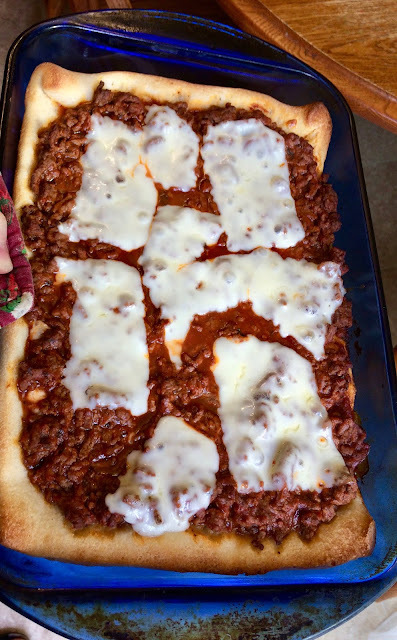 I just want to say I have been trying to stay true to the recipes and not make major substitutions, but using a whole pound of ground beef on this about killed me. I like to use beef a little more sparingly than this recipe calls for, but I wanted to give it a go. 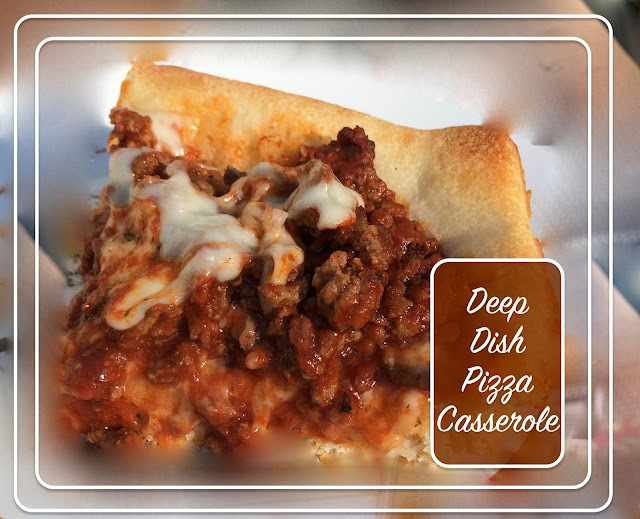 My husband and daughter really liked the meatiness of this dish, but I'll admit to wanting more cheese and less beef. Overall, the idea was good. I might make it again using homemade crust, less beef and more cheese of the shredded variety. Removing some meat would also help with the point value. And using 8 ounces of 2% mozzarella would up the cheese factor without too much calorie damage. Find the original recipe on page 13: 100 Favorite Weight Watchers Recipes. Preheat oven to 425 degrees. Brown beef and drain. Add tomato sauce and cook until heated through. Spray a 13x9 baking dish with nonstick spray. Unroll pizza dough and press into pan, bringing it partway up the sides. Line bottom of crust with 3 slices of cheese. Top with meat and tomato mixture. Bake uncovered for 12 minutes. Top with remaining cheese and bake 5 minutes. Nutrition information is approximate and calculated at caloriecount.com. I used more than 3 slices on top because my slices were less than one ounce. It is so tasty, I just love to eat pizza and I love your menu of 30 days which you share with us to make in home through your recipe. Get the top quality of Commercial Pizza Dough press machine to make pizza in home.